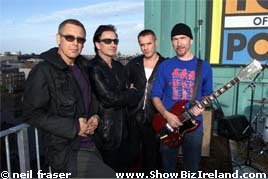 U2 guitarist The Edge confirmed to ShowBizIreland.com exclusively that the band would perform at this years MTV awards in Stockholm in November. "We look set to play the MTV awards. It's just about confirmed. So, I can safely say we will perform," The Edge explained. He arrived with the rest of the band for a gig that brought Dublin to a stand-still just after 3pm yesterday afternoon at their hotel. 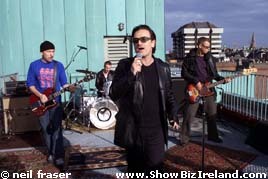 Speaking to ShowBizIreland.com at The Clarence Hotel, which they own, the band were performing two of their songs from their new album for the BBC Top of the Pops show. They sang their new song Beautiful Day and their next song Elevation. 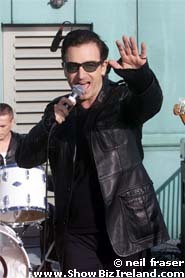 This was the first time the songs had been performed live. Beautiful day will be released on October 9th and the album All that You Can Leave Behind will be out for Halloweeen on October 30th. 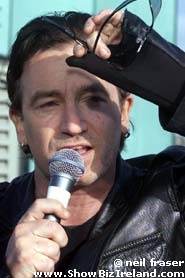 The band's singer Bono told us that the they were looking forward to touring again. "We are four people who love to hang out together and make music. A band, do you remember that? We love to tour and make music. It takes a lot for us to tour. We have to leave our mates and our families. So, this time I think we have 11 good reasons to leave. "We are going back to being a band again. We've copied a lot of stuff from The Beatles in the past and this is just another thing," he said when asked about the performance on the roof which was originally inspired by the Beatles.